The current and many historical coordinate and reference systems of all countries of the European Union (EU) including the eastern extensions from 2004 and 2007 and the systems of the European non-EU countries. The US and Canadian State Plane Coordinate Systems (SPCS) on NAD27 and NAD83 and other coordinate and reference systems of the North American continent. The coordinate and reference systems of the Australasian continent. Many coordinate and reference systems of the countries of other continents. World-wide NTv2 grid file supported coordinate transformations. All world-wide coordinate and reference systems in current use. The German coordinate and reference systems of the old and new federal states, the 40 Prussian Soldner Land Registers, the German 'Lagestatus', and exact reference systems of the German federal states. You will find a complete list of the coordinate and reference systems supported by the program on the internet or after downloading the free test version of the program. The NTv2 standard with national grid files is world-wide full supported. Apart from the given world-wide and state-specific systems, your own personal coordinate systems and geodetic reference systems can be defined with Helmert (Bursa / Wolf, ISO19111) or Molodenski parameters. Calculations can be performed with coordinates entered directly, loaded from files in various formats (Text, CSV, SDF, dBase, ArcShape and ArcGenerate), or passed via batch processing. ArcShape files can be viewed with the program-internal Shape Viewer. A programmable GPS interface makes it possible to read coordinates into a notebook computer from a low-cost GPS antenna. 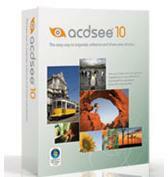 The program has a user-selectable German or English interface and comes with extensive bi-language online help. The program can be run on most common networks and it is possible to use Terminal Services on WINDOWS Servers. In case of a network installation the clients are installed automatically by the program. Use of any NTv2 fils for datum shifts. New coordinate and reference systems of Israel. Improved GPS module for receive of WGS84 coordinates. New Bonne coordinate and reference systems of Belgium and Portugal. 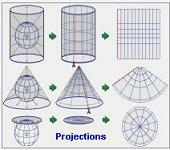 New projections Bonne and Equidistant Cylindrical (Plate Carrée). New coordinate and reference systems of Vietnam and of the French Departements.